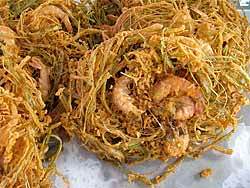 This blog is about the discovery of some delicious food in the small village of Takua Pa on the Western coast of Thailand, about 120 kilometers North of Phuket. Many of my fondest memories of Thailand are food-related. This should not be a surprise given Thailand’s reputation as an open-air food market. 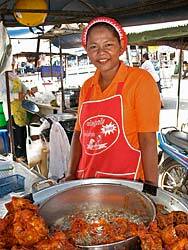 Kasma’s trips to Thailand have a heavy food emphasis, from stopping at markets whenever possible to sampling local food specialties wherever we go. Years ago Kasma used to pick up Thai travel magazines to get ideas for her trips. Each article would spend at least some time pointing out where the best food was and often there was an article devoted to a particular regional specialty. 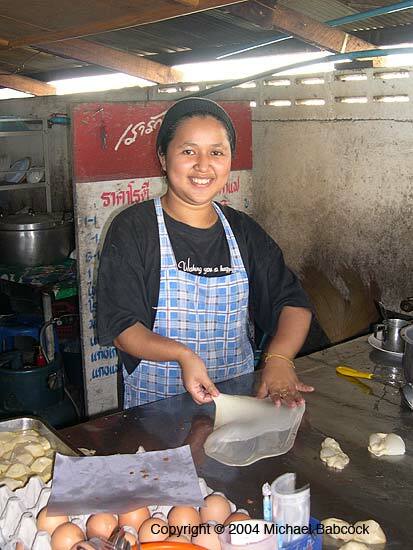 The most recent Wednesday Photo was on one of these stops – Ranong Buns. Kasma’s Southern Thailand trip always starts off by snorkeling at Mu Koh Surin National Park and then continues further South on the coastal highway 4. One of my favorite stops on the whole trip is the small town of Takua Pa. I try to eat a very light breakfast that day because I know what awaits us when we reach there later in the morning. First stop is the local morning market. As you drive down the coastal highway from the North, the market (actually called talad sohd, or “fresh Market”) is to the right of the road, right behind the bus station. where I can never refrain from eating two delicious treats. 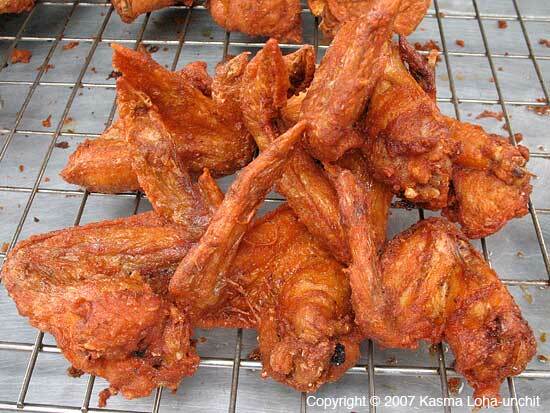 The first is Southern-Style Crispy Fried Chicken (Southern Thai, that is). 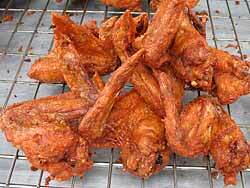 I’ll have to content myself with adding a picture of this delectable treat because there is no way to describe how delicious it is, with it’s very crispy, lightly salted outer skin and succulent meat inside. The other dish is also crispy fried, in this case small, delicious shrimp with a local green of some sort, breaded together and fried up. Yummy. I seldom see it done as well elsewhere. The market is also a good place to stock up on fruit – there are several vendors with beautiful produce and such fruit as rambutan, sala and mangoes. The market, however, is merely an appetizer for the next stop, which is at a small family-owned restaurant that specializes in roti, the Thai Muslim version of roti, that is. 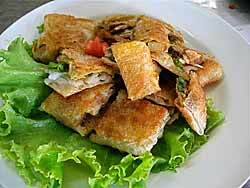 Southern Thailand is a good place to find roti and we take full advantage of this when we travel there. 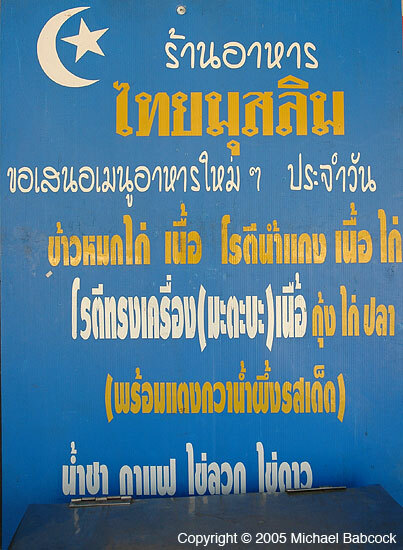 As you travel down highway 4 from the North, when you reach Takua Pa, keep a sharp eye out the left hand side for the sign here – it’s for the roti restaurant. It’s on the main highway, just past a traffic light (two doors down) at Thanon Wattana. In addition to roti they have another one of my favorites, Kao Moek Gkai, what Kasma calls (and teaches) as Muslim Yellow Rice with Chicken and Roasted Spices. 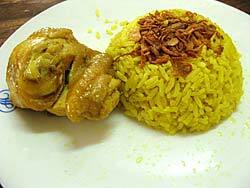 It’s delicious chicken served over rice that has been cooked with turmeric (hence the yellow color) and various other spices, such as cinnamon, cardamon and cloves) roughly in the style of an Italian Risotto. Like most roti restaurants in the south, it is owned and operated by cheerful Muslims. We’ve been visiting here for many years and they always greet us with big smiles and words of welcome. After we eat, Kasma functions as unofficial family photographer and takes many individual and group pictures, to be dropped off on our next visit. 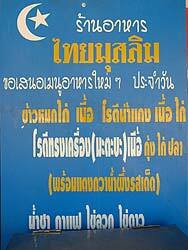 Perhaps the best thing about Thailand remains the friendly people. The main event, here, is the roti. Be warned: it’s a breakfast food and can sell out by mid-morning. We order it in at least three different forms: plain roti to be eaten with (very delicious) beef curry, stuffed roti (roti mataba), and sweet roti, both plain roti sprinkled with sugar and condensed milk and banana-stuffed roti. Sometimes we’ll also get egg roti. They also have Thai tea and coffee, to accompany the meal. 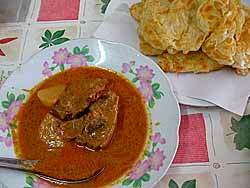 The roti here is especially good – crispy and delicious. It’s always fun to watch roti being made, as the cook flips out the rotis and then fries it to a golden, crispy perfection. This entry was posted on Sunday, February 7th, 2010 at 12:05 am	and is filed under Food, Markets, Restaurant, Travel. You can follow any responses to this entry through the RSS 2.0 feed. You can leave a response, or trackback from your own site. Oh, wow… Takua Pa. I am so jealous. I usually dive out of there when going to the Surins. I’ll have to try the roti and food next time. Thank you for making me miss Thailand… Boo. Beautiful pictures and descriptions. Thank you. Definitely YUMMY! 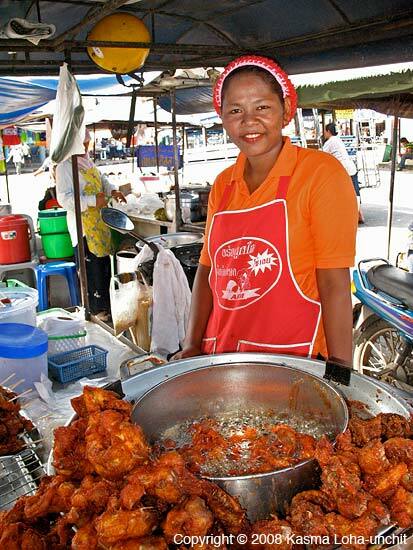 If you would like to have a real Thai taste, you’d better not miss the local food! so Tasty! CONFIRMED! I understand that you can keep Holy Basil leaves by drying them. I think I learnt that by reading your book. That’s good. Is there any way of keeping Thai Sweet Basil? I can’t get a fresh supply here locally so it would be good if I could preserve somehow. I tried freezing but they just turn black! :-( Have you tried growing the Thai Basils in the states? I’ve had success with the Sweet but not with Holy Basil for some reason. Kasma says you can dehydrate/dry sweet Basil but isn’t certain how flavorful it would be. I’d guess they’d be about equivalent to the dried Holy Basil — worth a try. We haven’t grown any basils here: they are so widely available at Asian markets and at local farmer’s markets in the summer and we use a LOT for our classes.